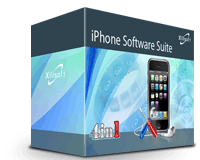 UDM Downloads > Xilisoft iPhone Software Suite! Xilisoft iPhone Software Suite consists of four iPhone apps: DVD to iPhone Converter, iPhone Video Converter, iPhone Ringtone Maker and iPhone Transfer, which can respectively convert DVDs and any video files to iPhone MP4 videos or MP3/M4A/WAV music, make iPhone ringtone from any video/music file, and copy PC files to iPhone and back up iPhone files to PC/iTunes. Features: 1. Allow you to split a file into several iPhone files by defined split time or size. 2. Restrict the output file size to the one you want with Bitrate Calculator. 3. Set start time and duration or end time to extract a segment for converting to iPhone video/music/ringtone. 4. Choose multiple profiles for one source file for outputting multiple iPhone video/music files from DVD/video in a single click. 5. All profiles are optimally predefined in parameters. And you can freely change the parameters like bit rate, frame rate, sample rate, etc. according to your personal need. 6. Enable you to open iPhone via Explore thus manage iPhone like a portable hard disk. 7. Create, delete and edit iPhone playlists; rate videos/music/photos with stars; view files in thumbnails or list mode; show you iPhone device info; search iPhone files quickly. 8. Help you add the converted ringtone into your iPhone directly without iTunes after making iPhone ringtone. 9. Support running DVD to iPhone converter and iPhone video converter in the background for less space occupation. 10. Before ripping DVD, converting video/audio and making iPhone ringtone, you can preview/pre-listen loaded DVD movie, video and audio. 11. Support batch file conversion and multithreading to convert multiple files to iPhone videos/music for saving time. 12. Set the after done action as shutdown, hibernate, exit or standby before converting DVD/video to iPhone to let the apps perform the action automatically after conversion.